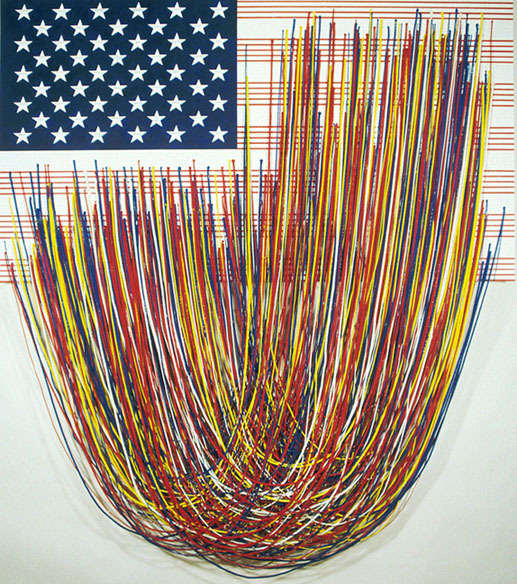 Gratitude, hand-painted rope, acrylic polymer, war song titles rubber-stamped into the stars, 81"x72"x9"
War songs from all American wars up to the present are stamped into the stars. In the central star is the name and rank of one fallen soldier. The yellow symbolizes hope for POW's and MIA's. My grid method of music notation was used for placement of the ropes; the music used were the war songs stamped into the stars.